You'll be £19.99 closer to your next £10.00 credit when you purchase The Territorials 1908-1914. What's this? 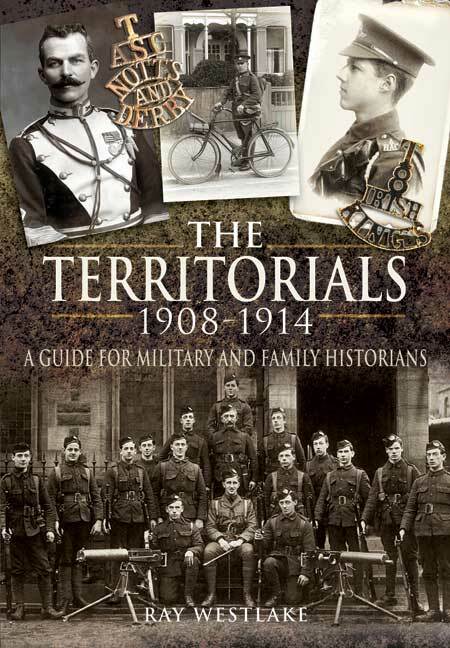 The Territorials 1908-1914 is a unique, comprehensive record of the part-time soldiers who made up the Territorial Force that supported the regular army in the years immediately before the outbreak of the First World War. Previously information on the history and organization of these dedicated amateur soldiers has been incomplete and scattered across many sources but now, in this invaluable work of reference, Ray Westlake provides an accessible introduction to the Territorial Force and a directory of the units raised in each county and each town. The origin, aims and organization of the Territorial Force are described as well as the terms of service, recruitment, equipment and training. But the bulk of the book consists of details of over 600 Territorial units plus a comprehensive account of every city, town or village associated with them. Essential information on the all the infantry formations is supplied, but also covered are the yeomanry, the artillery, the engineers, the Royal Army Medical Corps and the Army Service Corps. Ray Westlake's historical guide of the Territorial Force – the forerunner of the present-day Territorial Army - will be of enduring value to military and family historians. An invaluable reference work for anyone interested in The Territorials in the first part of the 20th century. In this book Ray Westlake continues his series of books on Territorial Units and Reserve Forces. The book is well laid out, starting with a description of the territorial Force and what previous groups were and how they operated, there are paragraphs on uniforms, medals and other awards of the Militia and Volunteer units and also a short piece on the Yeomanry. Then probably the most important part of the book is the Territorial Force gazetteer, an A-Z of all Cities, Towns and villages in the UK with TF associations, a short paragraph on the location with the Unit attached to it and where in the area the unit was situated. This is a user friendly research book, a well illustrated as are all of Ray Westlake’s books, there is a page at the end devoted to further reference and a short bibliography. A good read and ideal for family historians, professional researchers and military historians. The book is split into three sections. The first provides background information on the Territorial Force, includingunit types, rates of pay, recruitment and general definitions. All three sections are organised alphabetically, an idea that fits better in the second and third sections than in the first. The second sections looks at the over 600 units within the Territorial Force. This is a pure reference book, which will be of great value to anyone with an interest in thr territorial Force and for family histories attempting to trace people who served in the Territorials. There is so much in this tightly packed book that all students of the army of the period will need a copy close at hand. It will save you years of ploughing through the gazetteers and Army lists – Ray has achieved all of that for us. This book is claimed to be the first complete of its kind, providing both an accessible introduction to the part0time soldiers who made up the Territorial Force supporting the Army immediately before the outbreak of World War 1, as well as comprehensive directory of the units raised across the country. This concise guide to naval history and naval records is essential reading and reference for anyone researching the fascinating story of Britain’s Navy and the men and women who served in it. Whether you are interested in the career of an individual seaman, finding out about a medal winner or just want to know more about a particular ship, campaign or operations, this book will point you in the right direction. Includes references to the Glasgow Highlanders and the Glasgow Postal Telegraph Messengers Cadet Corps. From the very beginning of the volunteer movement in 1859, Glaswegians were involved in part time soldiering. This is a comprehensive reference book detailing the 600 or so Territorial Units created following the Territorial and Reserve Forces Bill of 1907. These Units supported the Regular Army prior to World War One. There is a description of their origins and aims with details of terms of service, recruitments, equipment and training. The bulk of the book is taken up with two comprehensive reference sections; the first lists the Units in alphabetical order with their locations and headquarters, while the second is a gazetteer of all the cities, towns and villages associated with the Units. Military historian Ray Westlake’s latest title is a comprehensive work concerning those part-time soldiers who made up the Territorial Force, a new organisation established in 1907 by the Haldane Army Reforms and forerunner of the modern TA. The majority of the book details the various Territorial units, and includes tan alphabetical listing with further information of every town or city associated with them. As such, this title will be a book to anyone with Territorial connections. A valuable reference source, much of the book consists of details of over 600 Territorial units plus a comprehensive account of every city, town or village associated with them.